R. J. Schiley, Meadow, South Dakota, bought Lot 4159, a Hereford bull at $9,250, with Roger Simon, Hoven, South Dakota. 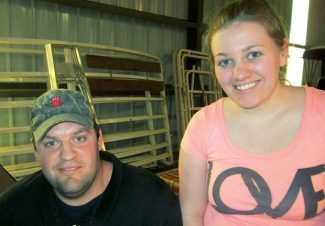 Dana and Andrea Goehring, Mound City, South Dakota, bought Lot 4228, an Angus bull, at $7,000. Location: at the ranch, Selby, S.D. It was a crowded place at the Thorstenson Hereford Ranch with many repeat buyers, plus a host of new people, looking for good Hereford and Angus genetics. It was a very competitive auction for these good Hereford and Angus bulls. The bulls were all on display outside in the sunshine, with the actual sale conducted in their comfortable barn via video screens. Thorstenson Ranch, homesteaded in 1886, is located in north central South Dakota near the beautiful Oahe reservoir. 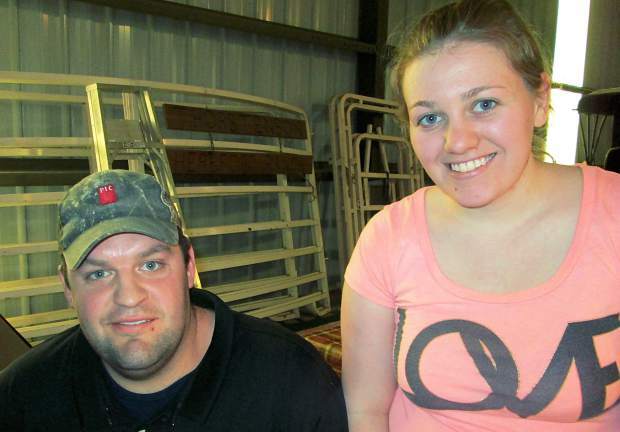 Bill and Paula, along with son, Darin and his wife, Danielle, operate the ranch. Thorstenson's strive to produce females with fertility, structural soundness and natural thickness. Their cowherd's production is based on their tremendous native grass. This was their first set of bulls from their powerful herd bull, NJW 37U 100 Trust 113Z. "Trust" is a homozygous polled herd sire from NJW's (Ned and Jan Ward, Sheridan, Wyo.) sale in 2013. He was the top selection for the Thorstenson's as he was the complete package. He had moderate birth and tremendous performance, with strong maternal cows in his pedigree. His sons were some of the top sellers in this sale. The top selling bull of the day went to Mike and Ron Pavel, Lesterville, South Dakota, at $12,500. This Hereford bull, Lot 4150, was sired by "Trust" and out of a daughter of THR Thor 4029. Born at 83 pounds, he weaned at 752 pounds to ratio 123, and reached a yearling weight of 1236 pounds. He was smooth and polled with a 40 cm. scrotal measurement. His EPDs were BW 4.2, WW 70, YW 109, MILK 21, M&G 56, and REA 0.81. Lot 4184 sold for $9500 to Brandon Rohrback, Roscoe, South Dakota. Another son of "Trust", he was out of a daughter of SMN 36H Mackintosh 0411. This bull was smooth, polled, long and muscular. Born at 87 pounds, he weaned at 694 pounds to ratio 114. His EPDs were BW 3.9, WW 55, YW 84, MILK 27 and M&G 55. Roy Schiley, Meadow, South Dakota, gave a final bid of $9,250 to own Lot 4159. This "Trust" son was out of a daughter of JDH 15 Wrangler 25L and weighed 85 pounds at birth. He weaned at 703 pounds to ratio 115, and had EPDs of BW 4.0, WW 65, YW 108, M&G 54, and REA 0.59. Selling at $9,000 was Lot 4215, a son of "Trust" who was out of a daughter of THR Thor 4029. He was wide-topped and deep-ribbed, with good eye pigment. He sold to Thomas Wudel, Parkston, South Dakota. Doolittle Wagner Ranch, LLC, Belle Fourche, South Dakota, was the top bidder on Lot 4140 at $8500. This "Trust" son was out of a daughter of JDH 15Wrangler 25L. Born at 84 pounds, he weaned at 607 pounds, and grew to a yearling weight of 1326 pounds. His EPDs were BW 4.1, WW 61, YW 107, MILK 24, M&G 55, and REA 0.60. 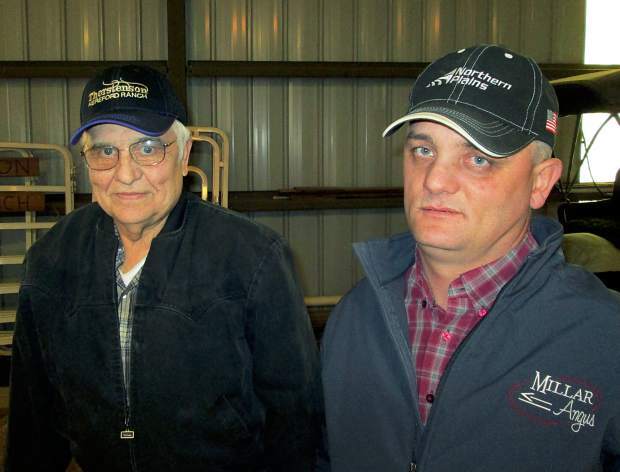 Lot 4194 – $8,000, "Trust" x THR Thor 4144, to Mike and Ron Pavel, Lesterville, South Dakota. Lot 4240 – $8,000, Mac's Rendition 20X x SH Online N212, to Tom Semmler, Parkston, South Dakota. Lot 4179 – $7,500, HH Advance 0001X ET x Arrow CL1 3023, to Kirby Peterson, Parade, South Dakota. Lot 4208 – $7,500, "Trust" x JA L1 Domino 1232L, to Mike & Ron Pavel, Lesterville, South Dakota. Lot 4213 – $7,500, "Trust" x JDF AH 25L Wrangler 15T ET, to Joel Zweep, Garretson, South Dakota. The top selling Angus sold to Gary Ringgenberg, Columbia, South Dakota for $8,250. He was Lot 4165, a son of Ellingson Dimension 1098, and out of a daughter of Lemar Final Answer 67T. Born at 75 pounds, he weaned at 692 pounds to ratio 114. Lot 4210, another Angus bull, sold to Marlin Thorstenson, Selby, South Dakota, at $8,000. This S Game Day 035 son was from a DCC Grid Maker 477N daughter. Born at 82 pounds, he weaned at 770 pounds to ratio 126. Give Bill or Darin a call. They would like to visit about how Hereford genetics can increase the quality of your cow herd.